Sunday afternoon back in Galway. July 20. Nearly August. Where has 2014 gone? Does anyone else feel like this year is flying by at an incredible rate? Having spent the last two weeks in Boston it’s been a nice relaxing weekend back “home,” kicking the jetlag and getting ready to get into a semi normal routine this week. Two weeks ago today, myself along with our initial class of hires flew to Boston for a two-week training and on boarding program to get everyone up to speed on what it takes to be successful working for SmartBear. The team had a blast and learned a ton. It was great to have them spend time with their US colleagues so now there is a face behind the name as we get started working together from the Galway office this summer. 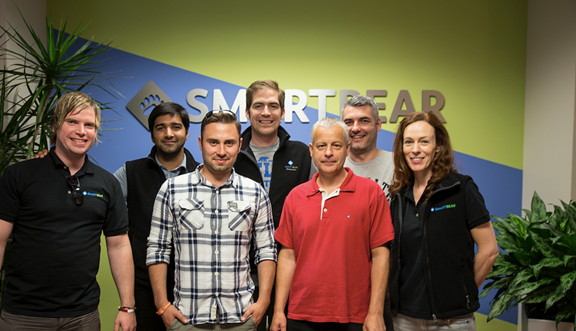 Founding members of SmartBear Ireland! -The food: the team was blown away by portion sizes. There was nonstop banter on American food habits the entire trip, leading up to our trip to the Cheesecake Factory for our penultimate meal in the States before heading home. To say the team was overwhelmed by the choices and plates would be a massive understatement. And then the dessert menu arrived. “Dear god I’ve never eaten so much” was a phrase tossed around daily. -Cultural norms: the Irish tend to not socialize right away at a new job, leaning more towards keeping their head down and trying to avoid making any early headlines, so they were very happy to see how warm and welcoming the entire Boston office was upon their arrival. As one team member put it, “We Irish tend to not socialize much the first year at a job, then the Christmas party happens where we all make fools of ourselves and hide away again at work until the following year.” Looking forward to our inaugural holiday festivities this year! -Annual Scavenger Hunt through Beverly and Salem: to further integrate our new team members with the company we hosted the annual scavenger hunt across the North Shore a week ago Friday, splitting up each member on a different team to allow them to meet as many new colleagues as possible. The day was a hit as we all raced around town going after the various clues and challenges, with one of our Irish teammates jumping in the ocean with our CEO, and yours truly being filmed at least a dozen times over singing the opening verse to Born In The USA. Can’t wait to see those videos resurface over the coming weeks. Thanks again for that, Gerry. As a friend put it recently, between July and August there is no place in the world you would rather be.